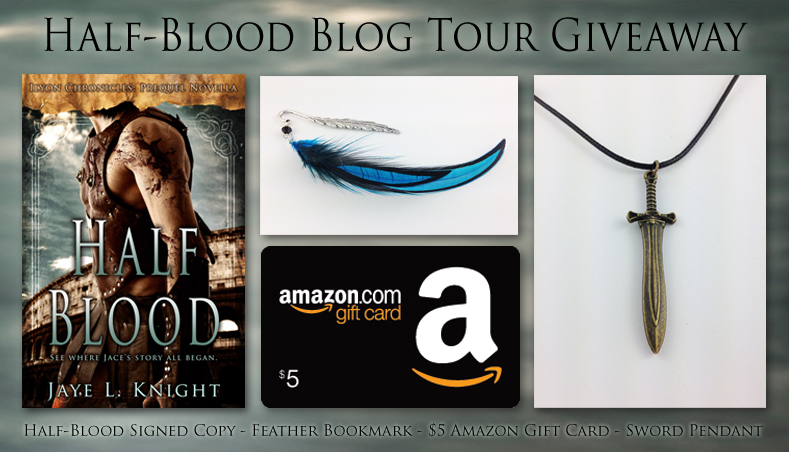 I’m excited to be part of the New Release blog tour for Jaye’s newest book. This book is a novella called Half-Blood. You may remember the cover reveal I participated in for her novella a couple months ago. I also had a chance to beta-read the book and now to review it as well. Without further ado, some info about the book and the review. And make sure you check out the fun interview as well. Check out the cover of Jaye L. Knight’s upcoming novella, Half-Blood, and learn about this prequel story to Ilyon Chronicles! Make sure you also enter the giveaway at the bottom! 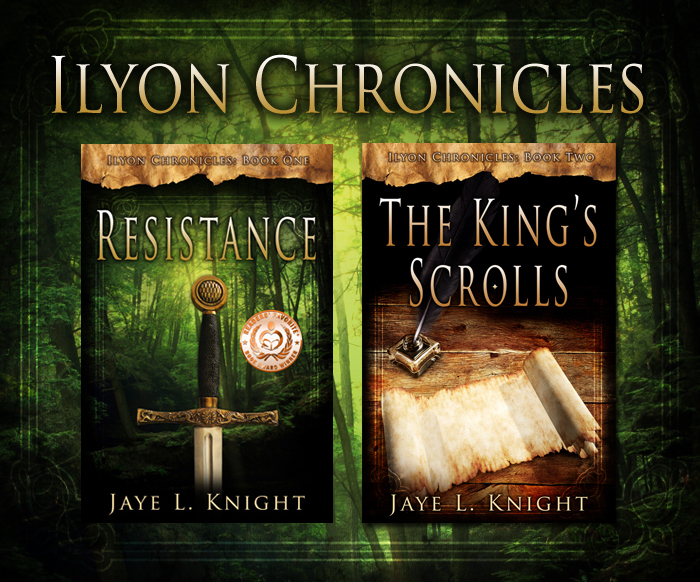 As part of a month long celebration for the one year publication anniversary of Resistance (Ilyon Chronicles – Book 1), Jaye is giving away several fun prizes! Enter for a chance to win using the form below! U.S. entries only please. If you have read any of the books in the Ilyon Chronicles, this one is a must-read. Not only is it a look into the life of Jace as he grew up, but it’s also a great lesson in how to treat others. For that matter, even if you haven’t read any of the Ilyon Chronicles, you should read this one just to learn how what you do affects others. And also to read an excellent story. As always, Jaye does a great job with character development. By the second page, I wanted to find Jace and hug him tight and tell him it will get better. But that would be a lie. 🙁 It does get better, eventually. But it also gets worse. Then better. Then worse again. I’m almost afraid of what will happen in books 3-6. But in this book, each character was portrayed well. The evil characters were sufficiently evil without getting too evil and some even had a few redeeming qualities. The good characters were good, but not too good. Dialogue isn’t Jaye’s strongest point, but it isn’t her weakest either. When there is dialogue, it is realistic, perfect for the character speaking, and well-written. The only problem I had with the plot would be a spoiler. And it was minor. And I’m really, really, really hoping Jaye tells us sometime in the next books. But, besides that, the plot is well done. A little scattered at times, but that is the nature of Jace’s growing up, so it fits the book well. So far, the only books I have read by Jaye that weren’t of high writing quality were the first books she wrote under a different pen name. Since then, her writing has grown and matured. I know I’ve said this before, but I don’t usually like Fantasy books, even Christian ones. Jaye’s Ilyon Chronicles are the only exception to that rule. Even Lord of the Rings and Narnia cannot compare to Jaye’s series. I have just eight words for you: I stayed up too late to finish it. Read this book. Make sure you have plenty of time to read it from start to finish and have a tissue nearby if you are prone to crying while reading. I would also suggest reading the first book in the series first to get to know Jace before you read this one. Warning: if you don’t like somewhat graphic whipping scenes, don’t read this book or any of the Ilyon chronicles. Though not described as graphically as they could be, there are whipping scenes that may be too much for some readers. Hi, Jaye! Welcome back to my blog! What was your favorite part about writing Half-Blood? It was a lot of fun to write about little Jace, but my very favorite part was writing the scenes at the farm when he first meets Kalli and Aldor. The poor dear was so awkward, but I love how he came to see what life was supposed to be like. That is a very sweet part of the book. Especially Kalli. 🙂 If you had to choose just one character as your least favorite character in all the books you have written (as Jaye and Molly), who would you choose? What is one piece of advice you would like to give to any authors or aspiring authors? Make sure you do your research. There are a great many common mistakes that can be avoided if you really study your craft and the publishing industry. Great advice, Jaye! Thanks for coming! I just finished A Captain’s Heart. I immediately came back here to see if Anthony was the one Jaye mentioned as her least favorite. Sure enough. He’s a snake. I don’t even know why he’s so loathsome, but he is.